This article first appeared in the summer 2013 edition of Arrivée, the Audax UK magazine and is reproduced by their kind permission. The main article is by Steve Abraham, with anecdotes provided by other AUKers. All photos are by Tim Wainwright unless otherwise stated. Riding the National 400, 2005. Photo by Ken Ascroft. I was about 12 then. I never knew who he was and neither Jack or I had ever heard of AUK. This was about 1986. I joined the CTC at 14 and started doing the reliability rides and club runs. Jack never rode club runs but he did used to do the reliability rides in the slowest time, because he didn’t like to rush and just went for the fun of it. Jack was a regular at the clubroom but I was never allowed to go, because it was midweek when I was at school. He never really knew about AUK, but began riding Audax with the CTC National 400s and always rode to and from those events, usually overnight. It was about at that time when my father died, I’d just left school and I was going to the clubroom and hearing some of his tales, which were very often ‘embellished.’ He was always one for telling a good story and adding in a few extras. He’d been doing Audax style riding before he knew about AUK. He used to do a tour of Scotland once a year and usually rode up non-stop from home. With Liz Creese at Willesden CC prize-giving dinner. was coiling itself up behind him. He did the same for a CTC National 400 in Devon. Riding home afterwards across Dartmoor at night in the rain he punctured, so decided to walk until he could find a street light to mend his puncture. He walked for a long time in the rain wearing his cape and finally gave up on finding a street light, so sat down and snuggled up under his cape out of the rain to mend his puncture. The next thing he knew, the birds were singing and it was daylight. He mended his puncture then carried on home. As a young and keen cyclist with a taste for long distances, I was told about AUK at the end of 1991 and joined straight away, then got stuck into Audaxing in 1992. Jack got wind of the rides I was doing and asked me about AUK, so I told him how to join and he joined in 1993 and the rest I suppose is history. He ditched the flowers and very soon the radio for Audax rides, though he did get a pocket radio with headphones in the late 90s. His original radio had a small speaker on his handlebars. We rode a lot of miles together and have shared many bus shelters where he often had a puff on his pipe, especially 1993 to 1998 until I moved to Milton Keynes. He never puffed his pipe while he cycled. It was in those years that I rode thousands of miles with Jack. AUK records show that he never rode an SR in his first year but I do know that he went straight into a 600 in his first season. We rode the Daylight 600 in Scotland together that year, which Jack always returned to do as it was his favourite 600. Great scenery and very easy navigation as well as being a well run event. 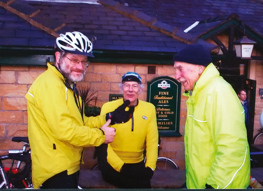 Jack had changed from some old guy I used to see now and then when I rode my bike to someone who was a regular at the CTC clubroom but did his own thing and I never really spoke to, to someone I used to chat with every week at the clubroom about Audax. We were often hanging around outside the door still talking after everyone had gone home after we’d been kicked out. Jack went on to do more and more. He never really bothered with the trophies he won. ‘They only give me this [veteran’s] trophy because I’m an old man.’ Though after I took the points award in 1996 he did say that he’d like to get the ‘Big Boys’ trophy,’ which he did in 2002. Another thing worth mentioning is the number of miles Jack used to cycle. His bicycles, all the same colour green, were his only transport unless he caught a train or on rare occasions cadged a lift, though he often preferred to cycle to and from events, often overnight. A typical year for Jack in the mid-1990s would be 22,000 miles. I did ask him about joining the 300,000 mile club but he wasn’t interested in being a member. He told me that he’d very easily done double that at the very least. I wouldn’t be surprised if he had the highest mileage in the UK, certainly a top five contender as a safe bet. It’s because of that why I am not a member of the 300,000 mile club too. Jack was a very big influence on my long distance cycling from when I really got into it. I learnt from Jack that following conventional methods isn’t always the best way of doing things. He was very aware of how marketing influenced what cycling equipment people used. Jack seemed to stick with what he knew worked for him and only took on board new ideas after a lot of thought and consideration. He wore clothing from Marks and Spencers. The jogging bottoms or shorts for summer weren’t really much different to what people wore pre-lycra and that was a time when people generally cycled further than they do now. He came from an age before lycra and saw it more as fashion than of significant practical benefit. If you really got to know what cycle components Jack used and what he wore, then you’d see a very well thought out, tried and tested system that worked very well for his needs. He did use Ever Ready lights but being a radio engineer for British Aerospace, knew how to turn them into reliable lights that seldom let him down. He passed on a few tips to me how to keep my Ever Readys working too and I ended up making my own home brew lighting systems before cycle lights became better than I could make. Jack knew that other people thought that his bike and clothing made things more difficult for him and he never bothered trying to argue about it. He found it much more fun to play along. They all seemed to believe him and Jack maintained a straight face. He also told me that he tried to smoke his pipe at the finish to wind them up but he just didn’t want it. Jack became a regular at BMB after that year. Jack always used to ride steady and not stop at controls, especially cafés, so he was always leapfrogging people. Cafés were expensive and cost a lot of time, though he would often have a sit-down feed on 400k or longer rides if there was a good café. He never saw the logic in paying £1 for a small glass of milk or cola when he could buy several glassfuls from the shop next door and not have to wait for it and had the same view about food, though he would stop for a hot drink on cold nights. He carried his food in his saddlebag, usually two litres of cola too and sometimes some milk. He often ate from his barbag on the move and sometimes stopped in shops now and then if he fancied something he wasn’t carrying. Jack was also fond of getting a good group together, especially at night. He often ended up waiting for people at controls who were tiring so that he could keep the group together. Sometimes he’d help people on events too, where he helped them ride nice and steady they would do the navigating. He really enjoyed getting in a good group that worked together well and rode at the same pace. 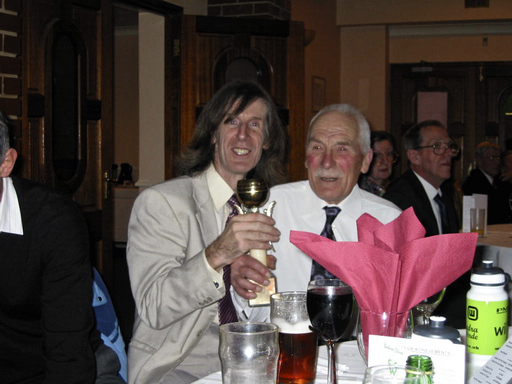 Receiving the Jack Eason International Trophy, 2002. One thing that must be said about Jack was that he was always cheerful and had a very good and often dry sense of humour. He had a set of jokes he liked to use on people. One of his, when someone commented that he was old, was to tell them he had a pacemaker fitted. After their reaction, he went on to say that he turned it up when he had to go up hills. He was good at keeping a straight face and often laughed about it several miles down the road and sometimes for a few weeks afterwards if it was a good reaction. Of course his most famous joke was when someone asked how he was. ‘Strugglin’,’ often said with a twinkle in his eye. He sometimes played practical jokes too. One of my favourite was when a salesperson did a demo at our CTC clubroom for movement detection alarms and how they could be used for cycle security. Jack turned up at the clubroom and parked his bike as usual and the demo began. Throughout the demo, Jack came up with simple practical solutions to any problems the salesperson came up with that his gadget could overcome, which often raised a laugh. As the demo went on, the salesperson asked for a bike to show how it could be used. Jack immediately volunteered his bike, pointed it out and told him to help himself. Someone went to fetch Jack’s bike and an alarm went off. ‘One pound fifty!’ Jack said, ‘I made that this afternoon with one pound fifty pence worth of stuff from Maplins!’ Everyone was laughing and the salesman had egg on his face trying to sell something at well over £30. After the demo the salesman had a small crowd but Jack had a much bigger crowd. That tale really does demonstrate the way I saw Jack. No need for elaborate new expensive ideas with big price tags when there is often a a much cheaper and better solution with just a little thought put in. All done with great humour and in good spirits. Jack will probably be mostly remembered for the big rides he did. Randonneur of the Millennium, his ISRs, all those 1200km rides abroad, his AUK vet’s awards and so on. But he also used to like to do ‘the silly rides’ for the DATC, just as a bit of fun. Those were the 100km rough stuff events and the like which he only did for fun. Typically, Jack never used an expensive mountain bike for just a few miles of cycling when he could walk the tricky parts. He used his old equipment on his rough stuff bike, only aiming to finish in time, though he often finished before people on their expensive mountain bikes. 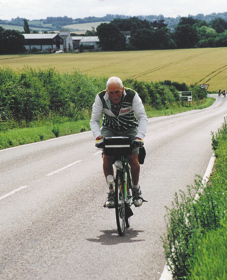 He also enjoyed using his bike for transport and just pootling along, racking up the miles just getting about. One thing that did strike me as a shame was that good lights and GPS came too late for Jack. His eyesight wasn’t too good, which was why he often went off route. He really needed his glasses to read his routesheet with, so usually navigated by memory of the route or just remembering the names of the next villages and following road signs. Just as diode lights started getting very good Jack became too slow for AUK time limits. He often used to ride with people and help them round events so that they could navigate for him. Easy navigation was one of many reasons he liked events in Wales and Scotland. He did have interests outside of cycling. 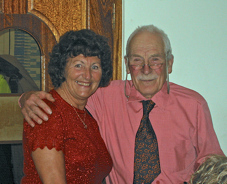 He liked jazz music, rock’n’roll and at CTC club dinners would be on the dance floor all night. He also liked tinkering with electrical stuff and repairing things, he had his allotment where he spent a lot of time and was also a radio ham. Jack was never one for keeping in touch. He never had a phone and used payphones if he ever needed to phone someone, so nobody could phone him up. The last time I saw him was January 2007 or thereabouts on a Willesden 200k Audax. I don’t feel sad that Jack has gone. He told me himself that he wouldn’t want to be in a bad way at the end of his life. My grandfather died at the age Jack was riding 1200km events regularly and Jack had done a lot more before that. We all have to go sometime and Jack had a good and long life. He’d never have wanted people to feel sad about him dying. I’m lucky to have known him and I hope that I’ve passed on some of that good fortune to anyone reading this. I first met Jack on the Cotswold Corker in February or March late 1990s. He had ridden to the start (I believe about 50 miles from home) and was noticeable for a huge sheet of plywood stuck up at the back of his bike carrying three early led lights. He rode steadily round whilst munching bits of food from his barbag, thus saving time at controls. At the finish of this early season hilly ride, Jack signed off and rode on home. How it should be done! RIP Jack. I first met Jack at Teethgrinder’s [Steve Abraham ed] house in June 2003, the year I started all this nonsense in order to do PBP. TG had organised the ‘Easy PB 600’ PBP qualifier, and I’d phoned him to ask if the hall would be open for a kip before the start. No, he said, but I’d be welcome to stay at his place … then added that Jack Eason would also be staying over. I detected a warning note in TG’s voice and wondered why he might be trying to dissuade me; he had probably assumed that I knew Jack, just like everyone else did. And that Jack snored. I didn’t get much sleep the night before my first 600! I leapfrogged him on many rides, only to arrive at the the next control where he’d be standing outside puffing his pipe and asking what had taken me so long. I’d ask how he’d been going … struggling as always. I’ve never seen anyone struggle with such little effort. 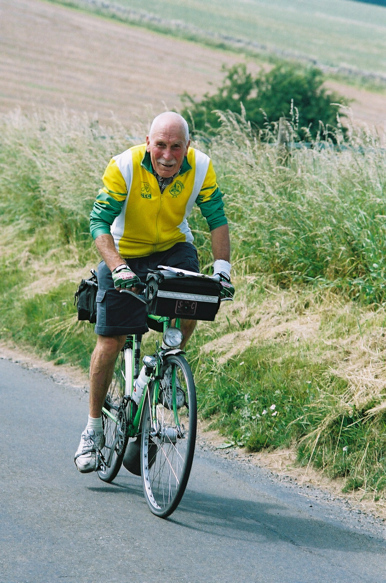 He told me that the best bit about PBP was riding to Paris – he inspired me to do that in 2003 and it really was a lovely extended prologue with the overnight ferry, hotel in Evreux, and finally all piling into the Purple Hedgehog at Trappes. Happy days. RIP Jack. I met Jack on the Kennett Valley Run in the early 2000s, and we leapfrogged most of the day with me catching him up when he was sat on a gate, etc, smoking his pipe. I finally got to the arrivée with about 40 mins in hand, Jack arrived 10/20 minutes later and when told the time said ‘D***** I had time to fill my pipe again’. RIP Jack and many thanks for the inspiration. I was a complete novice on Rocco’s freezing cold 200 PBP qualifier in 2003. 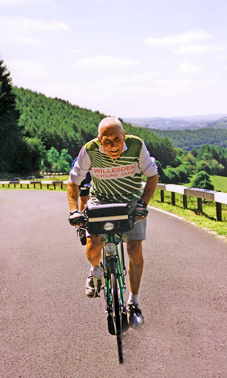 Kept on catching and overtaking, or being overtaken by this older gentleman on a green bike with flat handlebars. Think that he was accompanied by Mark Green on this ride. Anyway, it was a tough intro for me, had to stop at a service station and buy new socks to keep my tootsies warm. At the arrivée on a garage forecourt, Jack was holding court and explaining his mental tactics for dealing with 200s, 400s and 600s. When he had finished talking, he calmly lit his pipe, and chucked the match onto the forecourt. Subsequently bumped into him and Karl [Hrouda] on several long brevets, his participation was always a great source of comfort. Jack was an inspiration to me in my early Audax days. He (and his pipe!) were much missed when he stopped riding. When asked what he used to do for a living he’d always reply ‘burglar’. A line that I’ve shamelessly stolen for myself on more than one occasion. I hope he went in the way he would have wanted. A great character and it is possible that the stories he told and others told about him are all true. I recall the exasperation of the organiser of Boston-Montreal-Boston when Jack applied to ride it for the third time and he supplied a photo for identification as requested. It was of JE, aged three, sitting on his trike in the back garden. He added a note: ‘I’m a bit older now and I’ve got a big boy’s bike!’ It has been a privilege to have known him and I hope he can continue in his unique way, wherever he is. 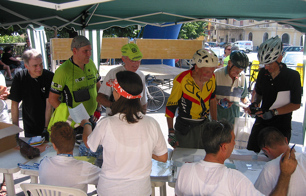 Sicilia No Stop 1000 with clubmates Peter Turnbull, Karl Hrouda and John Davies. The longest time I chatted to him was during the 2003 PBP prologue (for the free T-shirt and all). He would probably have finished that PBP if, when asked his name after a crash, he’d not answered ‘Napoleon Bonaparte’. French medical folk don’t understand that sort of humour and instantly pulled his card as being obviously concussed! Like lots of the ‘old hands’, Jack was a big part of my randonneuring. Lots of memories spring to mind, particularly Jack emptying one of the men’s dorms with his snoring on a pre-Christmas dinner ride that I regularly organised to Ivinghoe Youth Hostel and he and Karl Hrouda, his partner in crime, ‘enjoying’ the Sicily No-Stop 1000 and finishing a day late but having had a great time. [He joked to me ‘I thought it was going to be flat!’. Editor]. He was the only rider I know who kept a piece of Karrimat cut to fit the bottom of his Carradice saddle bag, so that if he wanted to sleep in comfort at a suitable bus shelter, he could rescue the Karrimat to sit on and slip on his yellow cape to keep warm, fuelled of course by his pipe. Whenever you asked him how he was going, ‘Struggling’ was the reply. Like hell he was! A great bike rider and enthusiastic allotment holder, who was strictly to be called Jack, not Granddad. Hopefully he’s enjoying the everlasting 200km rando up in the sky with those other AUK legends such as Mr Potts, Mr Jennings, Mr Richardson and Mr Lewis. I would like to thank everyone for the lovely tributes written about my father. It has been a great comfort to read them all. I know of many more anecdotes that have yet to appear. My father was always himself and behaved true to form throughout his illness and indeed was the Jack you all knew till the very end. He, as the family do, would have loved the idea of a Jack Eason memorial ride, for all the riders new to long distance cycling and strugglin’, the experienced ones trying to become super randonneurs, and those who already are and do it just for a giggle. Perhaps my brothers and I could join you on the first Jack Eason memorial ride. That famous shed-green bike – not pea green, was not just one bike, but several – all clones of each other. There was the everyday bike, the best bike, the off-road bike, the mountain bike, the long distance bike and the summer bike and of course the winter bike. Thank you again, I know my father would have been proud to read about himself in this way. I had a relatively short ‘Audax’ career, of around 3 years but, in doing so and qualifying for PBP 1999, I met Jack a number of times. 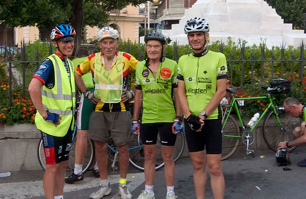 Aged ‘just’ 61, a ‘600’ that I rode, organised by Pam Pilbeam, did a big loop, from the South Coast, out to Bristol way and returned to the start, leaving a second, 200, loop to be tackled. I’d set up my airbed and sleeping bag in the back of my Astra, so, after some food, got in a few fitful hours of rest. Going back in to the event room, to grab some breakfast and ‘prepare’, who should I see but Jack, fast asleep, sitting at the main table, bolt upright on a hard, kitchen chair, hardly a restful position for anyone, let alone a longtime pensioner. “How long has Jack been there?” I asked quietly. “About an hour”. I set off into truly awful weather and was caught after 20 miles or so by Steve Poulton. He looked much stronger than myself but said he’d ride with me and we had a really great day together. Soon the sun came out and it was smiles all round as we made pretty rapid progress. With say 10 miles to go, I spotted a nice looking pub/cafe at the top of a hill and managed to persuade Steve that we should ‘celebrate’ with an icecream on me. We were just finishing our treat when a young rider sat down at our table and glanced back down the hill. “Oh no!” he exclaimed “Jack’s about to catch me …… again”. Sure enough, Jack was almost at the pub. I recall that it was in that year’s PBP, when Jack chose to buy another bike, rather than be delayed by broken components, finished the event with Karl, inside the limit, and, as did a few others, set off to ride home. As for myself, I finished ‘ok’ in 86 hours and didn’t ride my bike again for over one week! A very inspirational gentleman. I have only just ‘found’ this page and with it, this ‘news’ ….. I first rode (read : participated on the same events) with Jack during the nineties and remember being told some great stories … that his bike had broken during an event in Wales, so he bought a cheap mountain bike at a service station and finished the ride; that he’d been found at the roadside ( ? sleeping ? ) during a Randonneurs Mondiaux ride in Scandanavia (eg over 1200 km) and taken to hospital, but discharged himself and completed the ride; that he’d slept on the station at Chepstow before the ’99 600 km (he’d helped me a lot as we rode in the last 100 miles), having cycled from home to the start, but needed to kip somewhere. now, I have no idea how embellished or otherwise were such stories ….. but, I was fortunate enough to have ridden with Jack on a number of occasions and on the second day of the ’99 PBP, I was riding in a small group with him when the crank on his bike broke. as a french-speaker, I was sent ahead to source a replacement crankset in the next town … whilst Jack ‘scooted’ his bike (ten km or so, if I remember correctly) to the control, where it was subsequently installed in his bike. needless to say, he went on to complete the ride. he was about a day quicker than me, despite ‘giving me’ about 25 years !! Jack was a (deserved) legend ….. it was a privilege and a pleasure to have ridden with you Jack ….. ! !